La Jolla-based cooking company hosts auction evening for non-profit organization. Lajollacooks4u hosted a charitable auction evening last month with the Southwest division of Volunteers of America (VOA), a nonprofit organization that provides affordable housing and other assistance services primarily to low-income people throughout the U.S.
Gary McCormick was the winner of the auction raffle and brought along a group of his family and friends. Chef Chris Gardner served as the guest chef and designed a magnificent menu consisting of local spotted grouper and porcini-rubbed chicken breast with orzo, feta cheese and grilled asparagus, followed by a stone fruit crisp dessert with vanilla bean ice cream and sautéed berries. 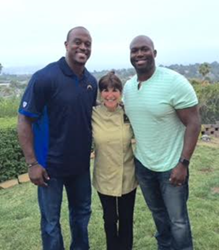 To make the evening extra special, Chef Chris rounded up two former San Diego Chargers players, Kassim Osgood and Jacques Cesaire, to join in on the fun. It was an evening filled with delicious food, great company and a beautiful venue. Founded in 1896, Volunteers of America Southwest serves over 13,000 individuals, children and families annually in San Diego, San Bernadino, Riverside, Orange and Imperial counties. For more information on the Southwest division of this organization and the charitable work they do, please visit http://www.voasw.org or contact Bradley Bianchi at bbianchi@voa-swcal.org. Lajollacooks4u, founded in 2008, provides an ideal activity for corporate team building, couples and any foodie looking for a unique cooking and culinary experience in a magnificent setting overlooking the Pacific Ocean. Based in La Jolla, a suburb of San Diego, CA, Lajollacooks4u has enjoyed record growth since its inception in 2008 and has been ranked as one of the area’s top attractions on the popular travel review site, Trip Advisor. Chef and Founder Jodi Abel also recently released her cookbook, Lajollacooks4u: California Cuisine, an accumulation of the favorite recipes her guests have been raving about. For more information about her cooking events, as well as her cookbook, please contact jodi(at)lajollacooks4u(dot)com or visit http://www.lajollacooks4u.com.